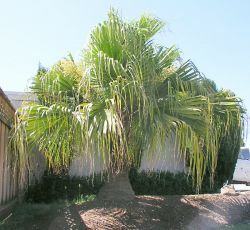 Comments: Fan palm native to Taiwan and Japan. Green fronds shreads into 70 or so segments which cascade giving this plant a fountain like appearance. Mature tree to 30' in ideal conditions. Seeds are the size and shape of small olives but are turquoise to blue-green in color.